Richard Silverstein assesses how the campaign to demonise Jeremy Corbyn as an antisemite was promoted and developed and how it parallels attempts to discredit progressive US politicians. Ever since Jeremy Corbyn became a serious contender for Labour Party leader and later when he ran a surprisingly competitive election campaign, the UK Israel Lobby has been sharpening the knives against him. He is insufficiently pliant to Israeli interests. 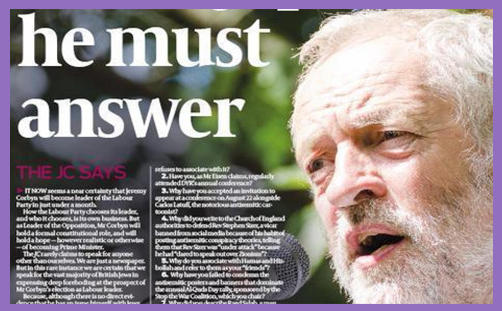 He is not subservient to the Lobby in the way previous Labour Party leaders have been. In addition, UK Jews are overwhelmingly Tory voters, so the prospect of a genuinely left-wing Party leader has given them the willies. It has motivated the UK Lobby to escalate its efforts. The accusations of antisemitism came right from the beginning, and they haven’t ceased for a second. They come in waves, all orchestrated by the Board of Deputies, the Israeli embassy, Bicom and their ancillary lobbying entities. When one wave of accusations recedes, another one comes along. This campaign is readily facilitated by the UK press. Of Course the Tory tabloids and broadsheets like the Sun, Mirror, Mail and Telegraph offer screaming headlines about the fatal scent of anti Semitism in the ranks of Labour. Even supposedly liberal papers like the Guardian have lent their pages to the fulsome fusillades. U.S. publications like the NY Times, not to be outdone, sic their pro Israel columnists on Corbyn’s alleged fatal flaw of Jew-hatred. We even witnessed the spectacle of an attack from resident pro Israel scribe, Bret Stephens. Bari Weiss can’t be far behind. Among the latest charges: that several Corbyn insiders belong to a 2,000 member private Facebook group which has published antisemitic comments. So get this, several key figures in Corbyn’s circle either joined and were joined (depending on how your permissions are configured, sometimes Facebook Friends can sign you up for a group without your even approving it) were members of a group of 2,000 people among whom there were unspecified members who posted antisemitic material. Corbyn’s folks didn’t post these comments. In fact, we don’t even know if any of them posted even a single comment in the group. None of them commented upon, liked or approved of the antisemitic posts. So what exactly is the offense? That they didn’t take the offending member out and shoot him? Or that they didn’t denounce the rhetoric? How could they if they didn’t participate in the group? What does it mean that you are listed as a member of the social media group? That you are personally responsible for every word published there? Nonsense. The latest charge is a real doozy: after Corbyn asked to meet with the UK’s communal leadership, it refused unless he submitted to a series of conditions which were ridiculous and oppressive. Instead, Corbyn chose to spend the Passover seder with a group of far more congenial UK Jews, progressives as well. The members of Jewdas, a left-wing ant-Zionist group which opposes the mandarin Zionist leadership. Well, the Jewish Chronicle and Deputies got wind of this and went to town. They passed it on to the Blairites wing of the Labour Party and before you know it renegade MPs were denouncing Corbyn’s breaking matza with Jewish antisemites. Guess what happened next? The UK Israel Lobby thought better of their shameless posturing and accepted Corbyn’s invitation to meet…with no conditions. Exactly the approach they should’ve adopted from the beginning. So Jeremy Corbyn and Jewdas taught the Lobby derech eretz, an ancient Jewish custom of showing decency to your fellow human being. What especially irks me is hearing non-Jewish, non-progressive MPs telling Corbyn and the rest of us who are the good Jews and who are the bad. And using a yardstick that has nothing to do with Judaism or Jewishness and everything to do, not just with Israel, but with an ultra-nationalist Likudist vision of Israel. Excuse me, but Moses didn’t come down from Mt. Sinai with tablets on which the Zionist creed was inscribed. He came down with Ten Commandments, which taught us as Jews how to be decent, ethical human beings. Not good Zionists, but good humans. That’s Jewdas’ vision and mine as well. Maybe it’s yours too. Strangely, though the charges are articulated in a fashion which assumes they pose a self evidently fatal blow to Corbyn, they aren’t. He bounces back as strong as ever. In fact, if anything, these scurrilous attacks ricochet and strike at the ones who launched them. Corbyn soldiers on, gaining support from quarters impervious to the traditional gutter snipe politicking of the tabloid press. The Brits are not the only ones suffering from this ridiculous malady. Here in the U.S., our very own homegrown Israel Lobby and its media organs like the Algemeiner, Jewish Press, Washington Free Beacon, etc., stand like sentinels in the night protecting us from the anti Semites lurking among us. The problem is that they always manage to dig up the usual suspects, and for some strange reason they’re always Democrats. Not just any Democrats, but progressive Democrats, least beholden to Israeli interests and the power of the Lobby. They are often African Americans, as well. These attacks harken back to an era when Blacks and Jews first diverged from their mutual embrace of the civil rights agenda of the 1960s. Beginning in 1967, many Jews drew away from the Black struggle for justice and were drawn into Israel’s nationalist euphoria after its victory in what was called the Six Day War. This was also the era when Meir Kahane first developed his racist, nationalist platform, which is now triumphal within Israeli politics. Ever since this period, pro Israel Jewish communal leaders have viewed the community’s interests as divergent from, and even inimical to the Black community’s. We saw this most clearly in the campaign by wealthy, white Jewush leaders to cast suspicion on Barack Obama’s bona fides as a supporter of Israel. He was called closet Muslim, anti Israel and even anti Semitic by some. The pages of the Jewish Forward were even filled with such false and provocative ads paid for by the Republican Jewish Coalition. Nothing Obama did could assuage the naysayers and doomsayers. Though he was a traditional Democratic presidential candidate, captive to the Lobby, none of it did any good. The Lobby, under the influence of its Likud masters in Israel never warmed to him. Even worse after Obama left office, Lobby groups like the ADL are suggesting he should apologize for being photographed in 2007, before he even ran for president, at a Congressional Black Caucus luncheon with Louis Farrakhan. Thankfully, Obama has ignored such nonsense. Things are, if anything , worse with Bernie Sanders. A true populist, though with a strong pragmatic streak, he is seen as far too independent for the Lobby. His views on Israel, though calibrated in an extremely cautious fashion (long time lib-Zio DC operative, Matt Duss, manages his Israel messaging), elicited extreme fear and loathing from the Lobby. But there is one major problem it has in attacking him: he is Jewish. Not religiously Jewish. But Jewish in the traditional cultural-political sense. He’s a liberal Democrat from New York. He sounds like us, looks like us, and thinks like us. So the usual attacks don’t stick. Sanders too, has been careful to manage his Israel messaging (and I don’t mean this as a compliment). Though it is distinctly to the left of Obama’s, he is careful not to rock the boat too heavily. After all, his main issues are domestic and economic. He is not a foreign policy wonk. That’s not where his passions lie. So Bernie is not prepared to die politically on a hill called Israel. But Bernie has political allies who aren’t as insulated as he is from such attacks. Take Rep. Keith Ellison, who ran unsuccessfully for Democratic Party chair. The Lobby went into full attack mode then. They dredged up decade old comments he’d made praising Louis Farrakhan. 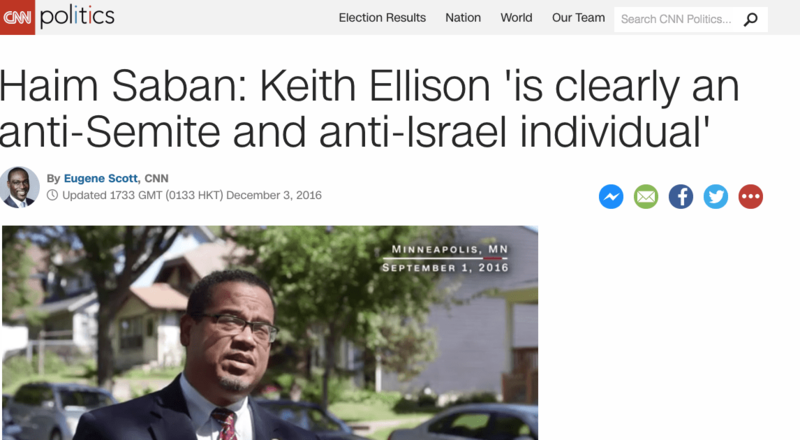 Ellison is a proud progressive with a national profile. He is not beholden to the Lobby. Therefore, he poses a threat. That’s why its minions have dredged up an an old story that Ellison attended s 2009 dinner hosted by Iran’s president Hassan Rouhani. Farrakhan attended the same dinner which was falsely reported by the Forward as a “private dinner” with the three of them. In fact, 150 guests attended and Farrakhan was seated across the room from Ellison. What do we learn from this? That the Israel lobby in both the UK and U.S. is threatened by true progressives. They prefer pliant, conservative politicians who do what they’re told without argument. We also learn that these two Lobbies are racist and Islamophobic. They they are anti populist and anti-democratic. They prefer Tories and Republicans. They prefer oligarchs and the white, monied classes. In short, they disapprove of everything many of the rest of us stand for. Even the Jews among us. Especially the (progressive) Jews among us.